Need a little refreshing drink to cool off without all the extra calories? Then this recipe is PERFECT for you and a hot summer day I might add. It's fresh with just right amount of sweetness, and best of all: it's super easy to make! Stir in stevia, lime juice and salt into the watermelon juice until dissolved. 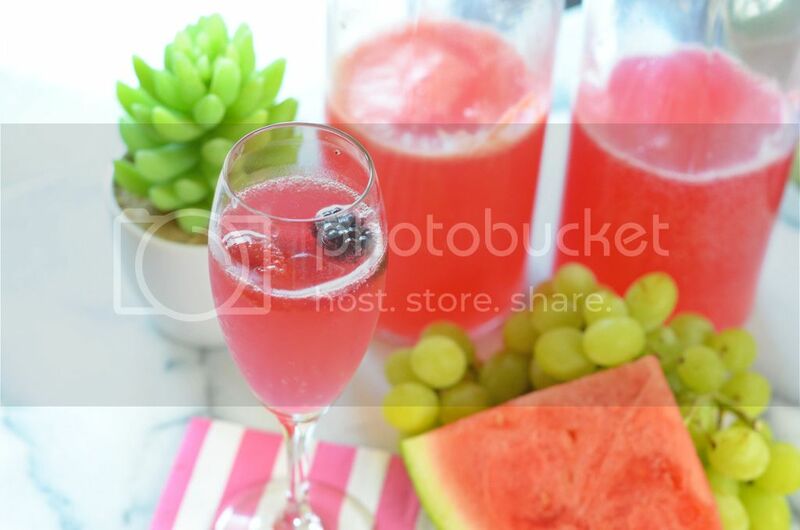 Serve individually by pouring 1/4 to 1/2 cup watermelon concentrate with 1/2 cup sparkling water in a glass. Top with ice and a lime slice. Serve as a punch: This recipe could also make a REALLY great punch for a barbeque or summer potluck, just simply multiply the recipe to suit your needs. Make sure to pretty it up by adding fresh fruit like: lime slices, strawberries, blueberries, raspberries and serve in super adorable mason jars (like shown above). You could also spike this recipe if that strikes your fancy (any spirit would do). Recipe above makes 5 to 8 servings. This sounds like the perfect summer drink! I think it might be! :):) I'm totally addicted!